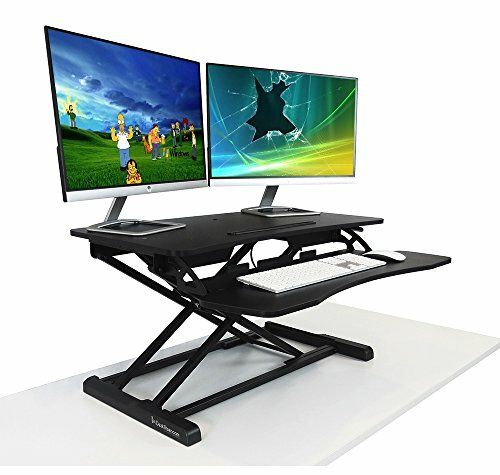 Heavy Duty height adjustable computer desk that is suitable for any office. Have you heard the phrase "Sitting is the New Smoking?" This multifunctional adjustable height stand up desk promotes better posture, reduced back and neck pain, a thinner waist line and increased productivity. Achieve long lasting health benefits like burning more daily calories, boosted productivity, improved posture and a reduced risk of heart problems. Adjust the height easily using levers on each side of the computer desk. Supports up to 30 lbs. Ergonomic design that adjusts to most users' heights. Don't worry about this adjustable desk wobbling like some competitor products. This is heavy duty and supports up to 35 lbs of weight. It uses two simple, easy to use hand levers to adjust up and down. Keyboard tray slides in and out allowing you to maintain an ergonomic position whether sitting or standing. Inside you will find a near fully assembled adjustable height desk - the only assembly needed it to attach the keyboard with 4 simple bolts. HEAVY DUTY Supports up to 35 lbs. Doesn't wobble like cheap alternatives. Ships FULLY ASSEMBLED. VERY EASY to adjust heights up and down. Uses proprietary spring loaded hand levers. Just squeeze and lift. Sit or stand in comfort with smooth height adjustment up to 20" above your desk surface with numerous incremental height options. Overall dimensions are 31.5 in Wide x 24 in Deep x 4 to 20 in H. Features a detachable keyboard tray that is 31 in W x 12 in D.
If you have any questions about this product by The House of Trade, contact us by completing and submitting the form below. If you are looking for a specif part number, please include it with your message.